Description: Northwest Debt Relief Law Firm is a business categorized under attorneys, which is part of the larger category legal services. 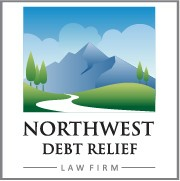 Northwest Debt Relief Law Firm is located at the address 1312 Main Street Vancouver, WA 98660 in Vancouver, Washington 98660. The owner is Tom McAvity who can be contacted at (360)558-3447.
Review: Northwest Debt Relief Law Firm helps client to resolve debt problems. We offer affordable payment plans for Chapter 7 Bankruptcy and Chapter 13 Bankruptcy and every bankruptcy comes with free credit repair services. Call our debt Settlement agency in Vancouver WA at (360)558-3447. Location & access map for "Northwest Debt Relief Law Firm"